True Rowing, based in Cambridge, is developing a rowing exercise system that incorporates visuals shot on rivers, including the Charles. It’s planning to eventually also use live video. An intense summer rain has begun pounding the rooftops of Harvard Square, but in the offices of a startup called True Rowing, it’s a blue-sky day on the Charles. The water is calm, I’m strapped into my shell, and Katy Perry’s “Roar” is playing in the background. My instructor is Danielle Hansen, a 24-year-old elite rower who has won gold at the Head of the Charles four times, including last year. I’m supposed to follow her cadence with the oars. True Rowing hopes to do for indoor rowing what Peloton has done for cycling. Peloton sells a high-end stationary bike and offers a subscription to an array of instructor-led workouts that play on a large screen. The Manhattan company, still privately held, raised more than half a billion dollars from investors this month. But unlike the spinning craze, which helped power Peloton’s ascent, sliding back and forth on an indoor rowing machine is not exactly a hot trend, True Rowing founder Bruce Smith acknowledges. “Rowing is a sport that nobody has ever championed,” Smith says. But, he points out, it’s a workout that uses roughly 85 percent of the body’s muscles and offers aerobic benefits. Yet most rowing machines rely on noisy fans to create resistance, and the workout involves staring at your knuckles as you pull a bar toward your chest. Smith is the former executive director of Community Rowing Inc., the nonprofit rowing club based in Brighton. It was there, he says, that he began “translating this arcane sport into something that could be genuinely impactful,” getting more than a thousand people onto the water on the club’s busiest days. Seeking to broaden the appeal of the sport even further, Smith incorporated True Rowing in November, began hiring employees in December, and left his position at Community Rowing this past March. The startup already has about 20 employees and has raised $5 million from investors. 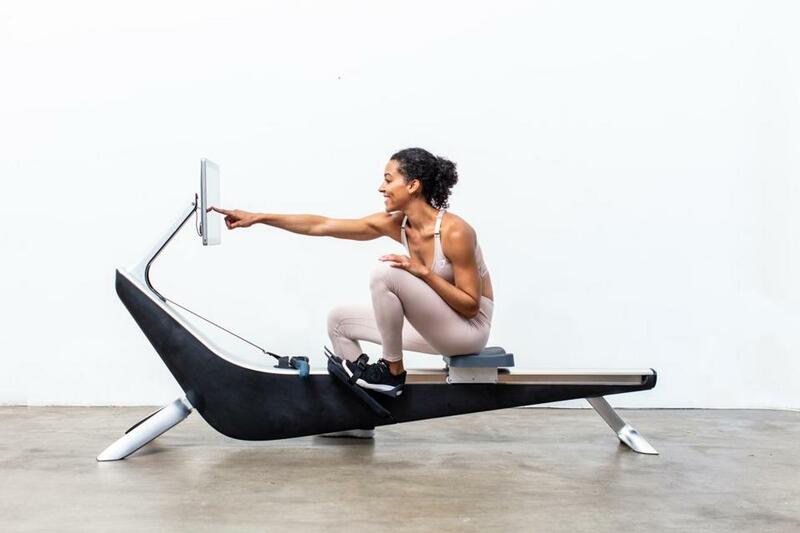 True Rowing has worked with two local firms, Essential Design and Cooper Perkins, to design a sleek prototype rowing machine. Smith says his goal is for it to look good enough for people to keep in the living room — not hide in the basement. The resistance mechanism relies on magnets, so it’s much quieter than other rowing machines. You’ll be inspired to hop on the machine because there’s a live workout happening in Miami Beach, Beijing, or Thames-on-Henley, England. And you’ll get to compare your stats on the screen with those of other rowers, in real time. Eventually, Smith hopes to bring this kind of “real-world workout” to indoor treadmills, cross-country skiing machines, and climbing walls. In the near term, however, True Rowing is working to build its first 100 machines with a manufacturing partner in Taiwan and expects to begin shipping them to customers early next year. Smith is using Peloton’s pricing as a guide: The bike costs about $2,000, and a subscription to the on-screen classes is $40 a month. “Our price will be very close to Peloton’s,” he says. True Rowing isn’t the only fitness startup layering new tech atop your daily workout. The company has recently signed distribution deals for its product with Life Fitness of Illinois and Gym Source, based in Newton. CEO Eric Janszen says the company is hiring regional sales reps around the United States. The story of another local startup, Perch, starts with excruciating pain: a herniated disc. Jacob Rothman was an undergrad doing a set of squats in the weight room at the Massachusetts Institute of Technology when he suffered the injury. It got him thinking about how technology might help weightlifters train more safely. The system that Perch has developed uses an iPad to let the user log in to a weightlifting station and access a personal routine, which can be crafted by a coach. A digital camera sees the world in three dimensions and follows the movement of the barbell the user is lifting. One important measure is velocity — the speed of each lift. “The coach can see if your velocity is lower and immediately take action,” Rothman says. The system can spot the difference between “strong and explosive” motions, or someone who is “barely completing his reps.” Future versions of Perch’s system, he says, will be able to track not just barbells but other items used in workouts, like medicine balls and kettle bells. Rothman says the company is focusing first on “the elite setting”: helping college and professional athletes train better while staying safe. Early customers include Harvard, MIT, Boston University, the Philadelphia Phillies, and a hockey training center in Connecticut. This summer, Perch is participating in Techstars New York, a three-month entrepreneurship program, and Rothman says the company hopes to raise money sometime this year. Michael Wood is a fitness coach in East Sandwich who has served as an unpaid adviser to Perch and is familiar with the VirZoom and True Rowing products. Each of these three startups is betting that the future of fitness will still be sweaty — but more fun.